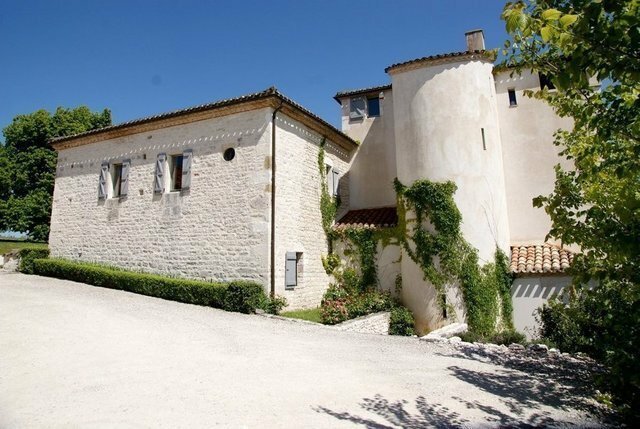 Charming hamlet without any disturbance, between Cahors and Puy L'évêque in 3ha30 of park, between rose bushes, cypresses, lavender, fig trees, limes and parasol pines. It has been completely renovated with a great deal of taste, on a total of 900 sqm. It comprises 4 houses in perfect condition. A main house of 420 m2 comprising: 2 large reception rooms, 2 fireplaces, 8 bedrooms with shower-room or bathroom, 2 kitchens, wine cellar. A gîte of 280 m2 comprising 5 large bedrooms with bathrooms, a large living room with fitted kitchen. A large barn of 100 m2 transformed into a loft with living room/library, kitchen, guest bedroom, shower-room. A caretakers house of 100 m2 with laundry, technical premises. Private swimming pool (14x7) and swimming pool for guests. Floor heating and radiators, oil heating. Excellent technical services. Superb 360° view. Very good rental possibilities. Reception capacity of 29 people + 10 children.